When I first wrote about Amazon QuickSight in 2015 (Amazon QuickSight – Fast & Easy to Use Business Intelligence for Big Data at 1/10th the Cost of Traditional Solutions), I mentioned that we would make the service available in Standard and Enterprise Editions. 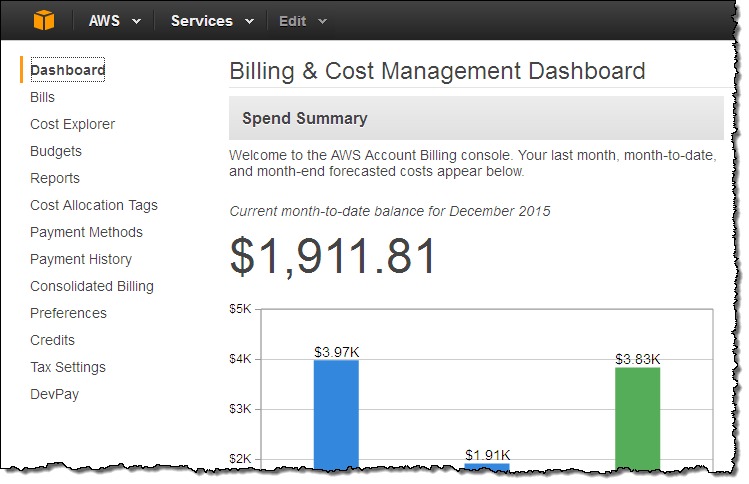 We launched the Standard Edition of Amazon QuickSight last month. Today we are launching the Enterprise Edition. Building on the capabilities of the Standard Edition, the Enterprise Edition adds Active Directory Integration and Encryption at Rest. 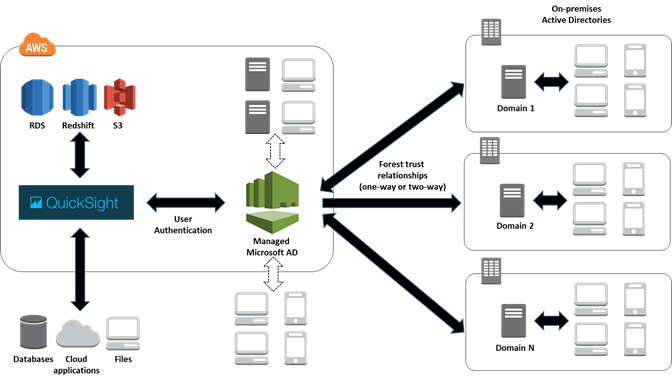 The Enterprise Edition supports user authentication via AWS Managed Microsoft Active Directory (AD). 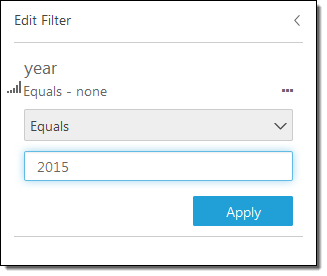 This allows your users to sign on to QuickSight using the credentials already in your AWS-hosted Microsoft AD or in a trusted on-premises AD. Either way, the Single Sign On (SSO) experience allows your users to get started more quickly and with less administrative overhead. 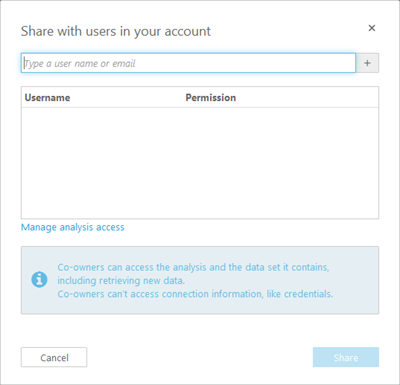 If you are responsible for administering your organization’s base of QuickSight users, you can bring thousands of users on board and manage their permissions with just a few clicks. 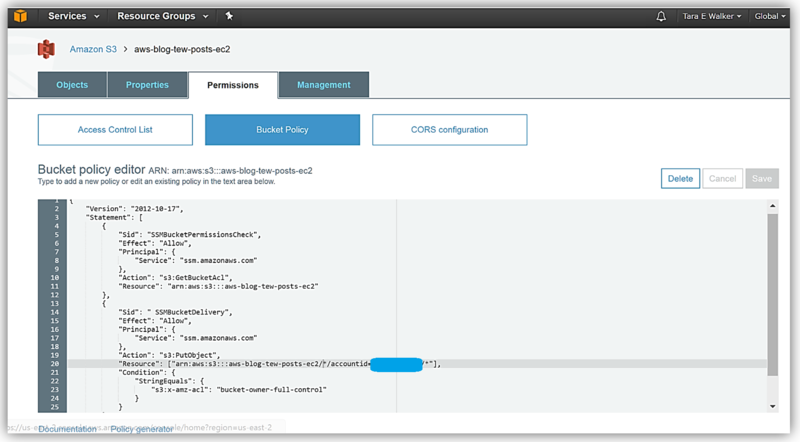 You can manage this user base using your existing toolset and with respect to your existing governance policies. 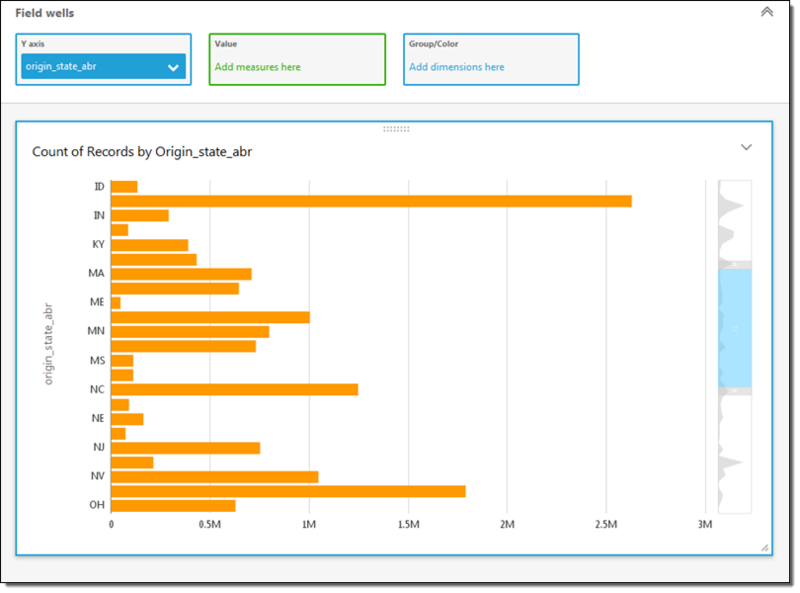 QuickSight relies on SPICE (Super-fast, Parallel, In-memory Calculation Engine) for highly scalable ad hoc analytics. 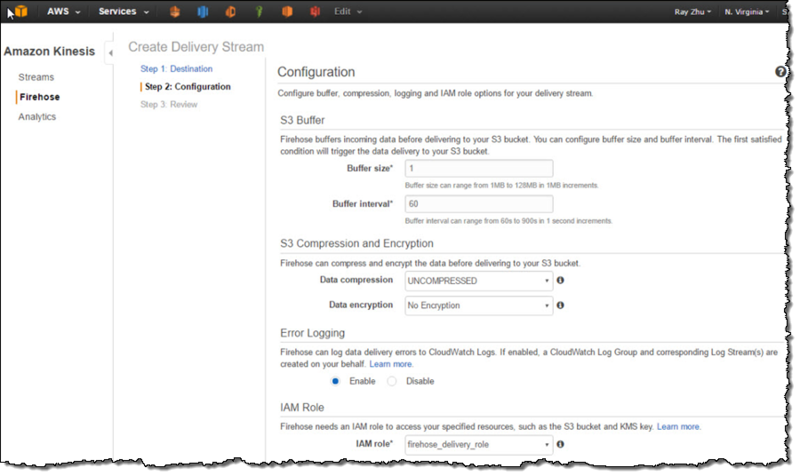 The Enterprise Edition of QuickSight encrypts data at rest within SPICE using keys managed by Amazon in order to provide an additional layer of protection for your data. 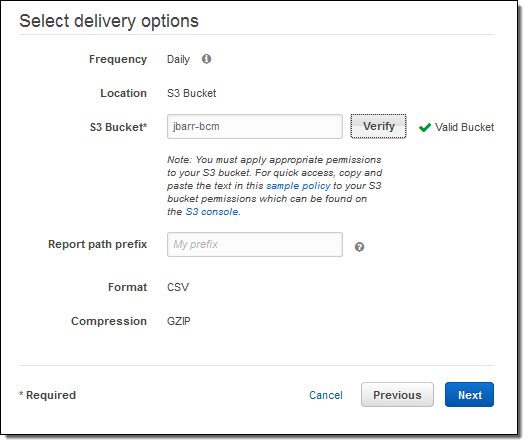 From the administrative side, setting up the Enterprise Edition of QuickSight is really easy, and requires that you sign in as an IAM user with the requisite set of permissions (visit Sign up for Amazon QuickSight with an Existing AWS Account and scroll down to Set Your IAM Policy to learn more). 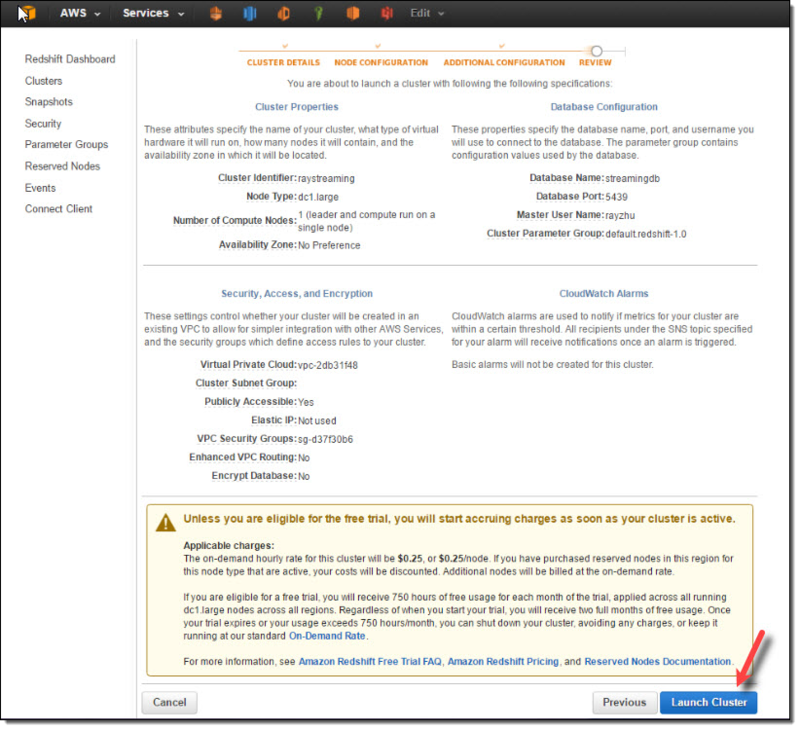 You select the Enterprise Edition, choose the AWS Managed AD Directory that describes your user community, and authorize access to the directory. Then you add (if not already present) an alias for the directory and use this as the QuickSight account name. 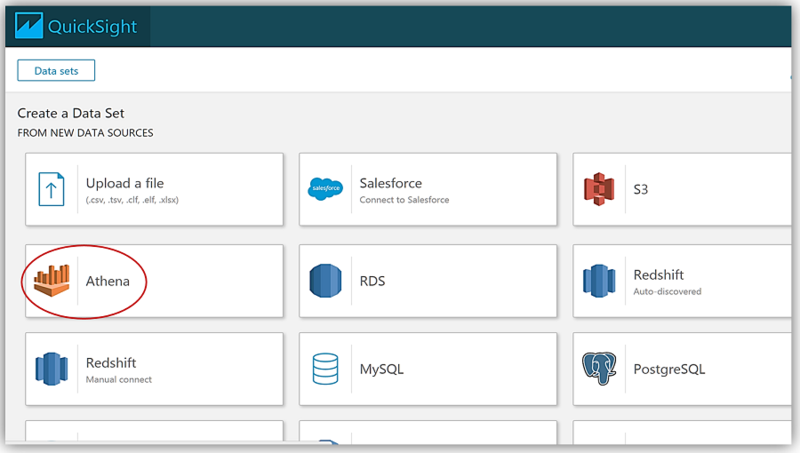 Finally, you pick the AD groups within the Managed AD or trusted forest and enable them for QuickSight access. 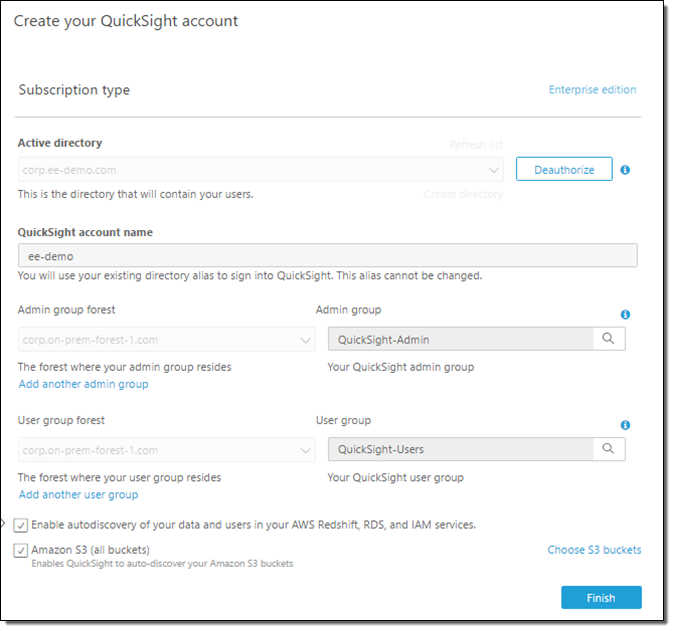 After you have completed the sign up process, users in the designated groups will be able to log in to QuickSight using the QuickSight account name (directory alias) and their existing AD credentials. 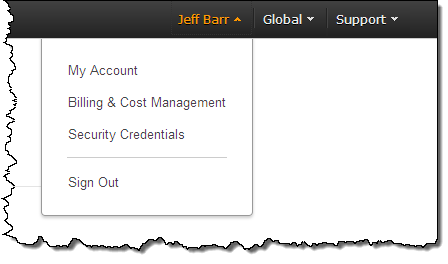 Password restrictions, timeouts, and user management are all handled through the appropriate AD (AWS or on-premises) settings in accord with your organization’s policies. You can manage group membership using your existing tools, adding and removing users and assigning user & admin roles as needed. 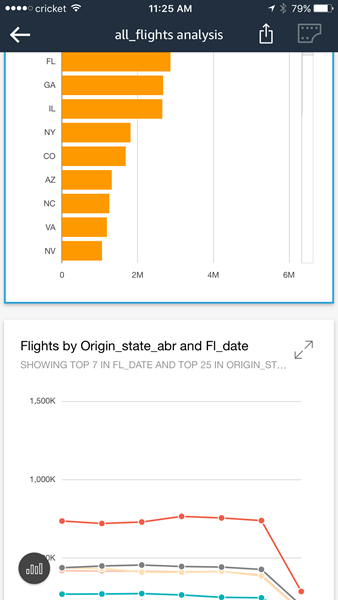 Amazon QuickSight Enterprise Edition is now available in the US East (Northern Virginia) Region, with SPICE capacity available in the US East (Northern Virginia), US West (Oregon), and EU (Ireland) Regions. 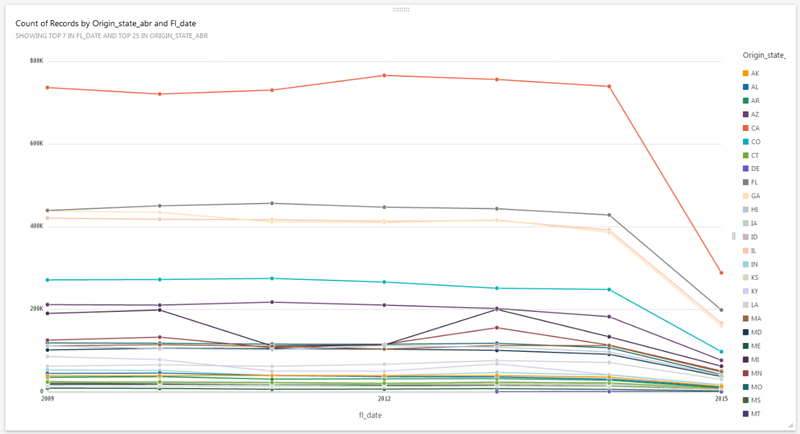 Pricing starts at $18 per month per user and includes 10 GB of SPICE capacity, which is pooled across all of the QuickSight users on the account (the single user QuickSight free tier and the 60 day, 4 user free trial apply to the Enterprise Edition as well). To learn more, visit the QuickSight Pricing page. If you have a Microsoft AD instance provisioned in the US East (Northern Virginia) Region, you can take advantage of the free tier and free trial, and get started today at no cost. Ray Zhu from the Amazon Kinesis team wrote this great post about how to set up a streaming data pipeline. He carefully shows you step by step how he set it all up and how you can do it too. 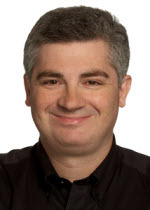 Consumer demand for better experiences is ever increasing today. Companies across different industry segments are looking for ways to differentiate their products and services. Data is a key ingredient for providing differentiated products and services, and this is no longer a secret but rather a well adopted practice. Almost all companies at meaningful size are using some sort of data technologies, which means being able to collect and use data is no longer enough as a differentiating factor. Then what? How fast you can collect and use your data becomes the key to stay competitive. Streaming data technologies shorten the time to analyze and use your data from hours and days to minutes and seconds. Let’s walk through an example of using Amazon Kinesis Firehose, Amazon Redshift, and Amazon QuickSight to set up a streaming data pipeline and visualize Maryland traffic violation data in real time. 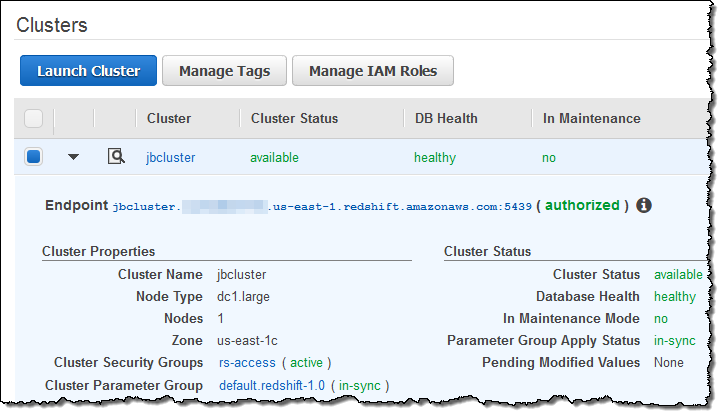 Under “Additional Configuration”, I make the cluster publicly accessible so that Kinesis Firehose and QuickSight can connect to my cluster. 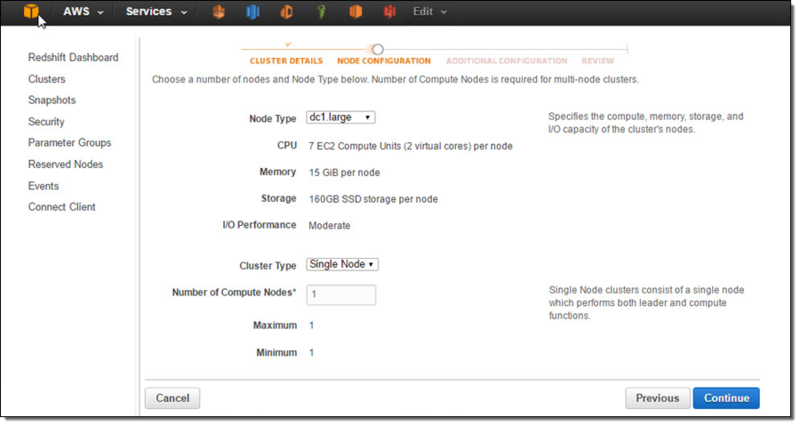 After reviewing all configurations, I click on “Launch Cluster”. Once the cluster is active, I go to the cluster’s VPC Security Groups to add inbound access for Kinesis Firehose service IPs and outbound access for QuickSight service IPs. Now the cluster is setup and configured. I’ll use a JDBC tool and the SQL statement below to create a table for storing Maryland traffic violation data. In this step, I’ll set up a Kinesis Firehose delivery stream to continuously deliver data to the “TrafficViolation” table created above. I name my Firehose delivery stream “rayredshiftstream”. 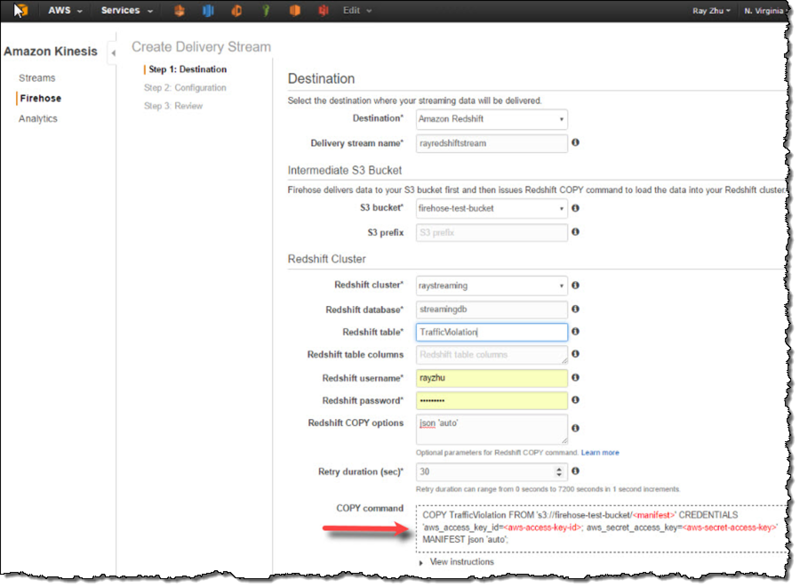 Under destination configurations, I choose “Amazon Redshift” as destination and configure an intermediate S3 bucket. 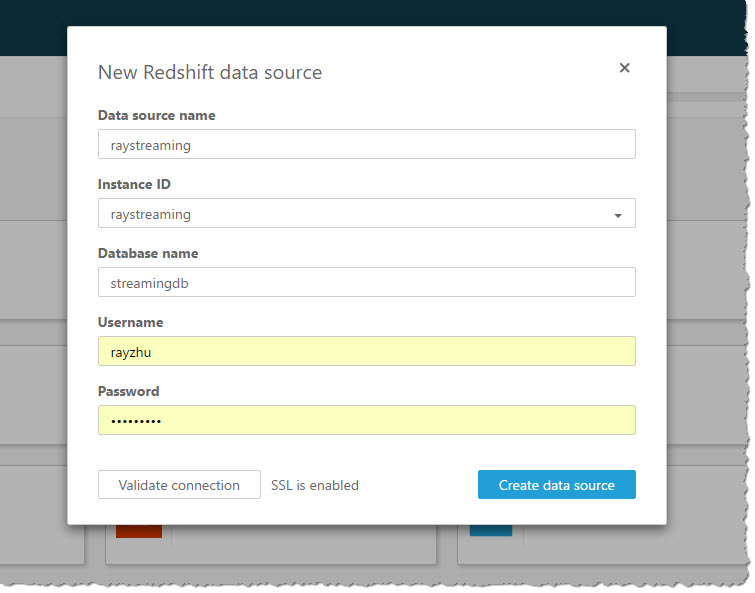 Kinesis Firehose will first load my streaming data to this intermediate buckets and then COPY it to Redshift. 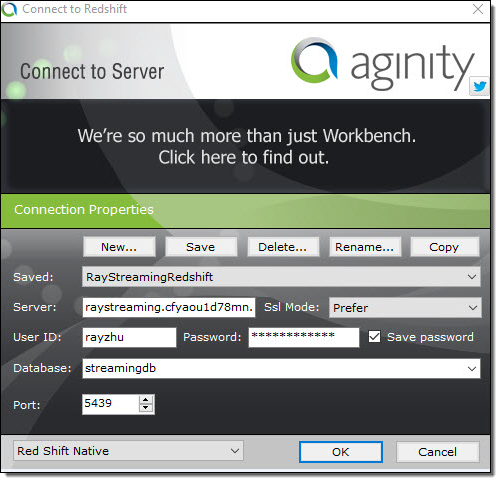 Loading data from S3 to Redshift is efficient and preserves resources on Redshift for queries. Also, I always have a backup of my data in S3 for other batch processes or in case my Redshift cluster is not accessible (e.g. under maintenance). 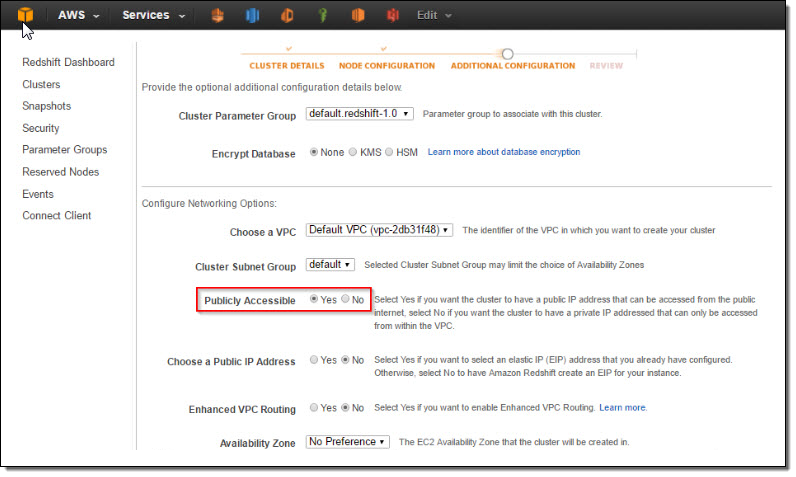 Subsequently, I enter the Redshift cluster, database, and table names along with Redshift user name and password. This user needs to have Redshift INSERT permission. I also specify “json ‘auto’” under COPY options to parse JSON formatted sample data. I set retry duration to 30 seconds. In cases when data load to my Redshift cluster fails, Kinesis Firehose will retry for 30 seconds. The failed data is always in the intermediate S3 bucket for backfill. At the bottom, the exact COPY command Kinesis Firehose will use is generated for testing purposes. On the next page, I specify buffer size and buffer interval. Kinesis Firehose buffers streaming data to a certain size or for a certain period of time before loading it to S3. Kinesis Firehose’s buffering feature reduces S3 PUT requests and cost significantly and generates relatively larger S3 object size for efficient data load to Redshift. I’m using the smallest buffer size (1MB) and shortest buffer interval (60 seconds) in this example in order to have data delivered sooner. You can also optionally configure Kinesis Firehose to compress the data in GZIP format before loading it to S3 and use a KMS key to encrypt the data in S3. In this example, I configure my data to be uncompressed and unencrypted. Please note that if you enable GZIP compression, you’ll also need to add “gzip” under Redshift COPY options. 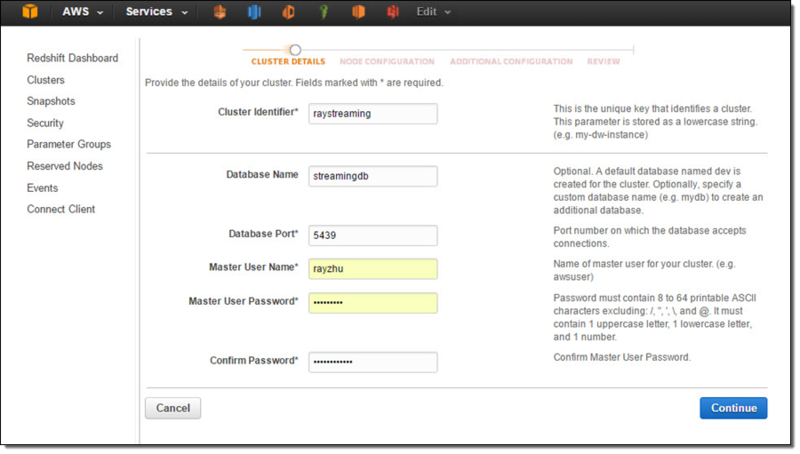 I also enable error logging for Kinesis Firehose to log any delivery errors to my CloudWatch Log group. The error messages are viewable from Kinesis Firehose console as well and are particularly useful for troubleshooting purpose. 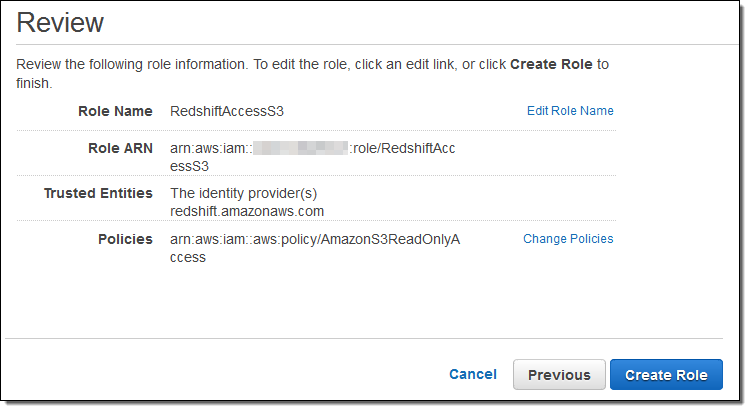 Finally, I configure a default IAM role to allow Kinesis Firehose to access the resources I configured in the delivery stream. 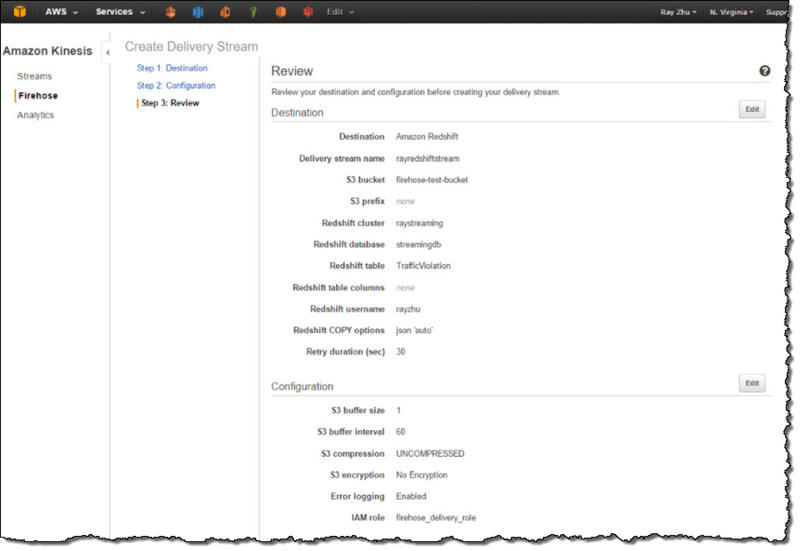 After reviewing all configurations, I click on “Create Delivery Stream”. 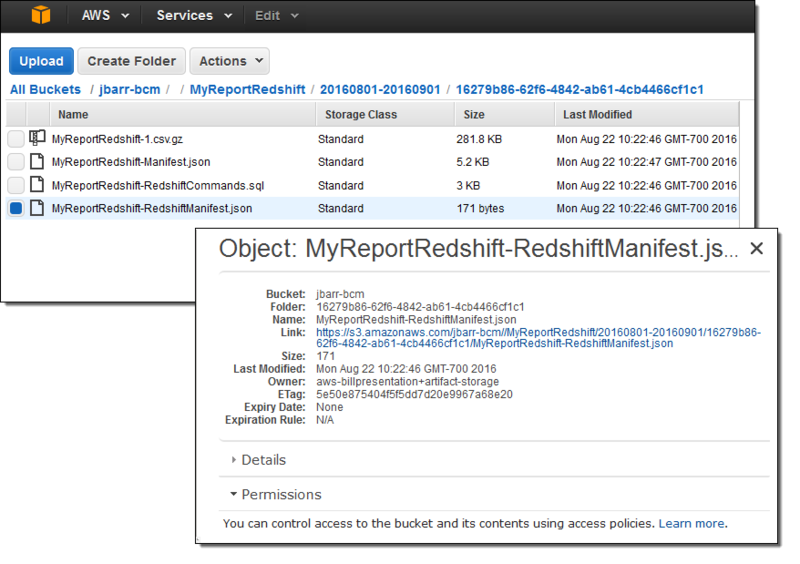 Now my Firehose delivery stream is set up and pointing to my Redshift table “TrafficViolation”. In this example, I’m using the Traffic Violations dataset from US Government Open Data. I use the Kinesis Firehose sample from AWS Java SDK to parse records from local csv file and send each record to my delivery stream. In real streaming use cases, you can imagine that each data record is pushed to the delivery stream from police officer’s cellular devices through Firehose’s PutRecord() or PutRecordBatch() APIs as soon as a violation ticket is recorded. A sample of the data looks like the following and includes information such as time of stop, vehicle type, driver gender, and so forth. As I continuously push data records to my delivery stream “rayredshiftstream”, I can see these data gets populated to my Redshift table “TrafficViolation” continuously. 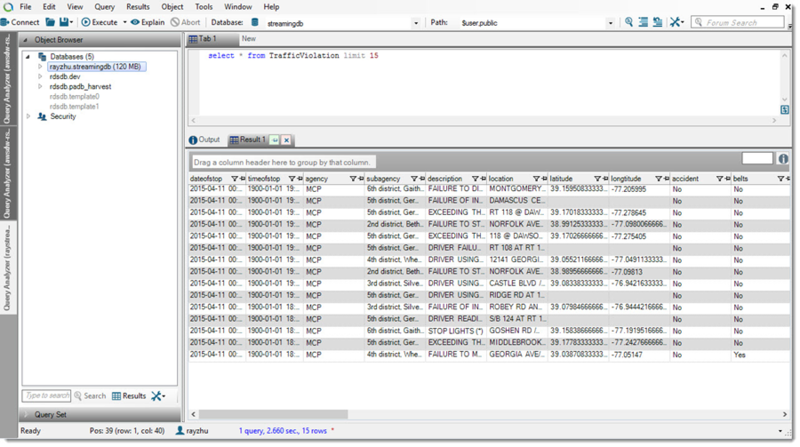 Now I’m going to use QuickSight to analyze and visualize the data from my Redshift table “TrafficViolation”. 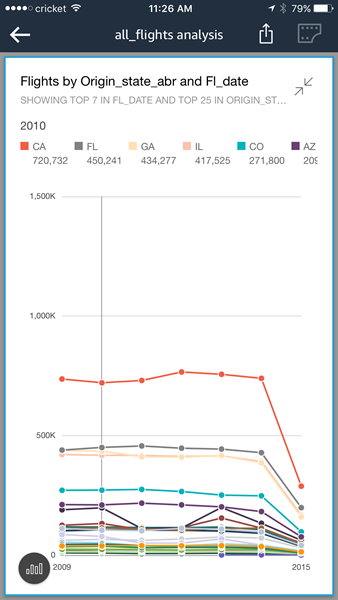 I create a new analysis and a new data set pointing to my Redshift table “TrafficViolation”. 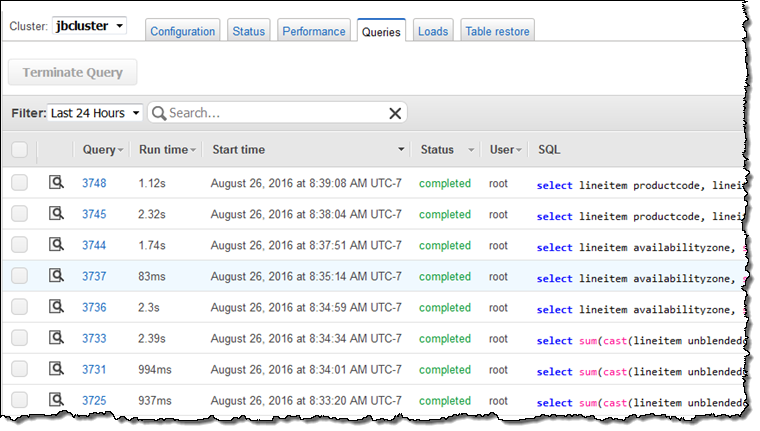 I use “Query” mode to directly retrieve data from my Redshift cluster so that new data is retrieved as they are continuously streamed from Kinesis Firehose. 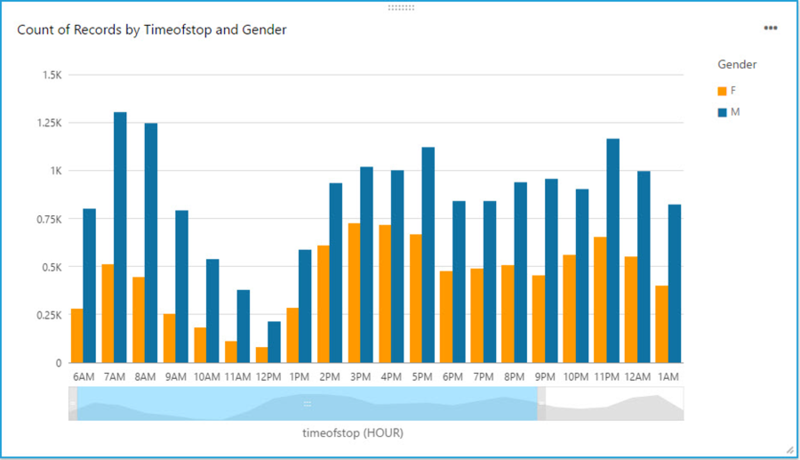 With a few clicks, I create a bar chart graph that displays number of traffic violations by gender and hour of the day. There are a few interesting patterns: 1) Male drivers have significantly more traffic violations than female drivers during morning hours. 2) Noon has the lowest number of violations. 3) From 2pm to 4pm, the number of violations gap between male and female drivers narrows. With a live dashboard, this graph will keep updating itself throughout the day as new data continuously gets streamed from police officer’s devices to Redshift through Kinesis Firehose. Another interesting live dashboard to build will be a map graph that shows a heat map of traffic violations across different districts of Maryland over time. I’ll leave this exercise to the readers of this blog and you can use your favorite Business Intelligent tools to do so. Hopefully through reading this blog and trying it out yourself, you’ve got some inspirations about streaming data and a sense of how easy it is to get started with streaming data analytics on AWS. I cannot wait to see what streaming data analytics pipelines and applications you can build for your organizations! 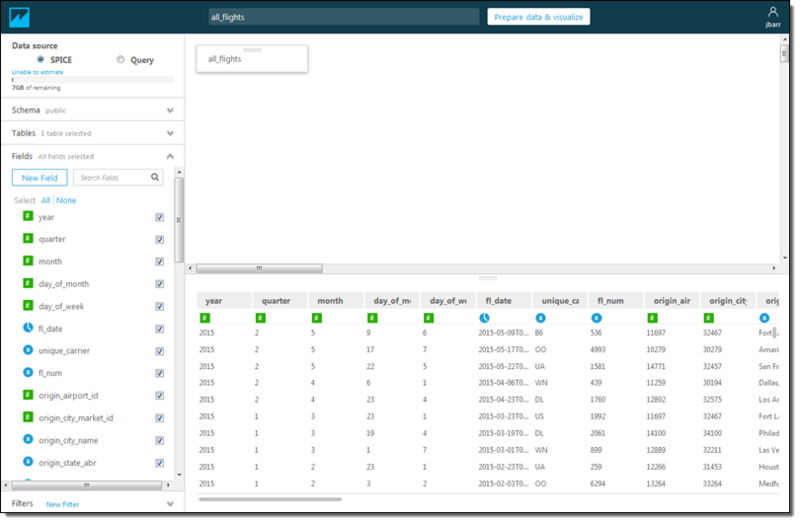 Amazon QuickSight provides you with very fast, easy to use, cloud-powered business analytics at 1/10th the cost of traditional on-premises solutions. 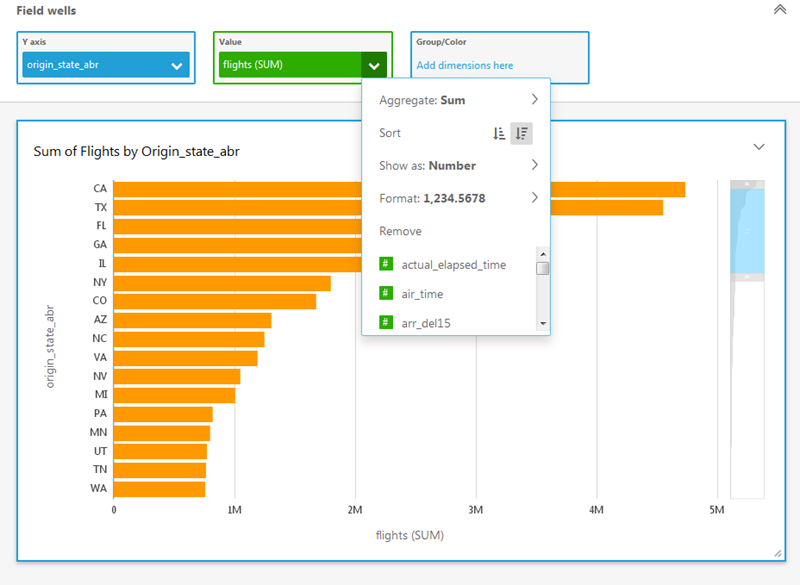 QuickSight lets you get started in minutes. You log in, point to a data source, and begin to visualize your data. 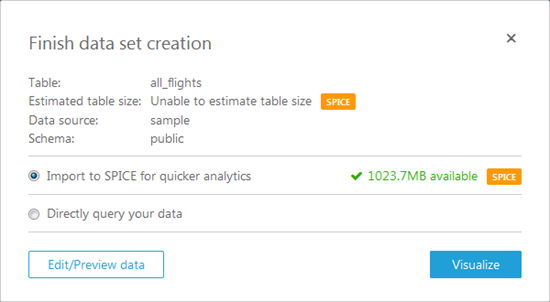 Behind the scenes, the SPICE (Super-fast, Parallel, In-Memory Calculation Engine) will run your queries at lightning speed and provide you with highly polished data visualizations. Every customer that I speak with wants to get more value from their stored data. They realize that the potential value locked up within the data is growing by the day, but are sometimes disappointed to learn that finding and unlocking that value can be expensive and difficult. On-premises business analytics tools are expensive to license and can place a heavy load on existing infrastructure. Licensing costs and the complexity of the tools can restrict the user base to just a handful of specialists. Taken together, all of these factors have led many organizations to conclude that they are not ready to make the investment in a true business analytics function. QuickSight is here to change that! It runs as a service and makes business analytics available to organizations of all shapes and sizes. It is fast and easy to use, does not impose a load on your existing infrastructure, and is available for a monthly fee that starts at just $9 per user. As you’ll see in a moment, QuickSight allows you to work on data that’s stored in many different services and locations. 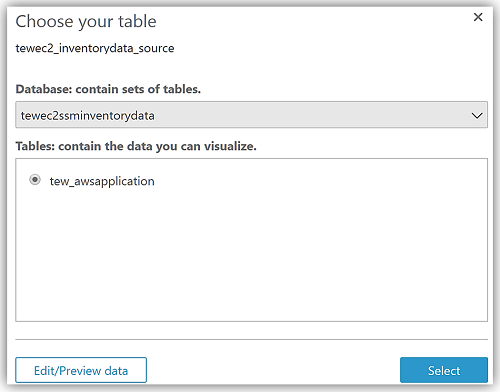 You can get to your Amazon Redshift data warehouse, your Amazon Relational Database Service (RDS) relational databases, or your flat files in S3. You can also use a set of connectors to access data stored in on-premises MySQL, PostgreSQL, and SQL Server databases, Microsoft Excel spreadsheets, Salesforce and other services. 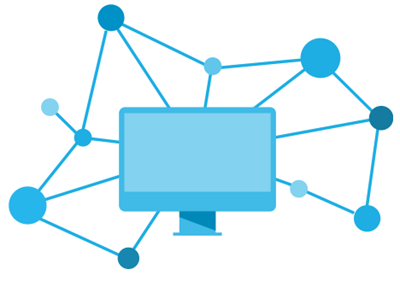 QuickSight is designed to scale with you. You can add more users, more data sources, and more data without having to purchase more long-term licenses or roll more hardware into your data center. 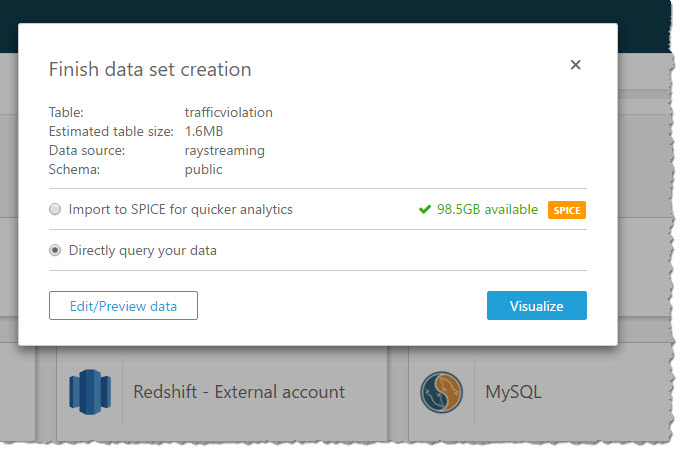 QuickSight comes with one free user and 1 GB of SPICE capacity for free, perpetually. 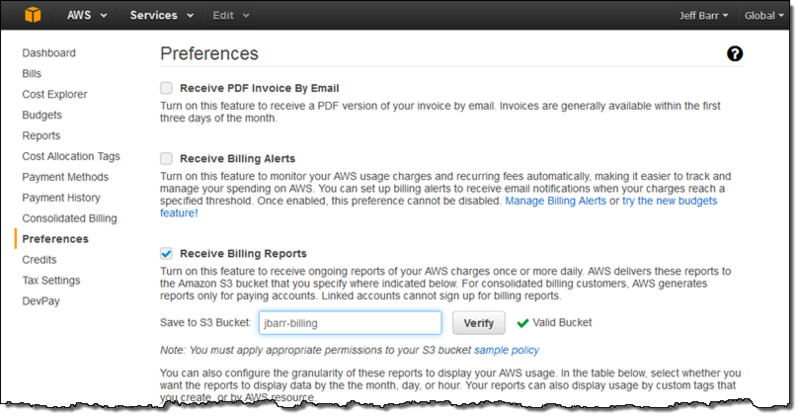 This allows every AWS user to analyze their data and to gain business insights at no cost. 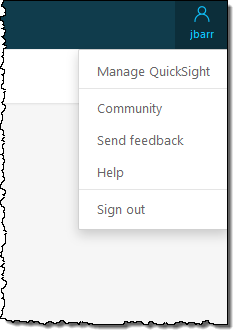 The Standard Edition of Amazon QuickSight starts at $9 per month and includes 10 GB of SPICE capacity (see the [QuickSight Pricing] page for more info). 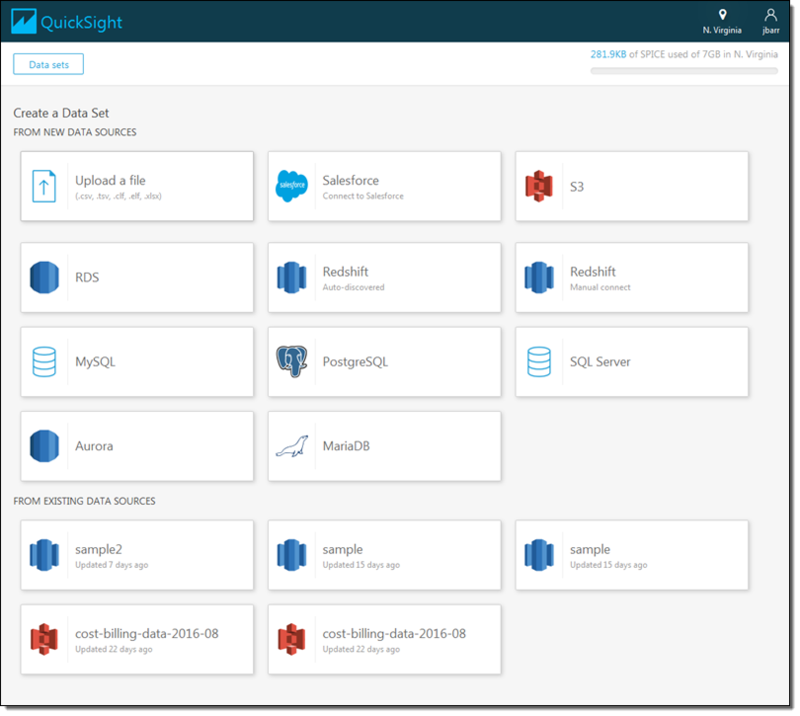 Amazon QuickSight is now available in the US East (Northern Virginia), US West (Oregon), and EU (Ireland) regions and you can start using it today. 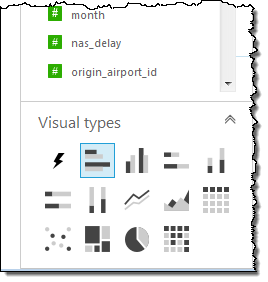 Despite the length of this blog post I have barely scratched the surface of QuickSight. Given that you can use it at no charge, I would encourage you to sign up, load some of your data, and take QuickSight for a spin! We have a webinar coming up on January 16th where you can learn even more! Sign up here. 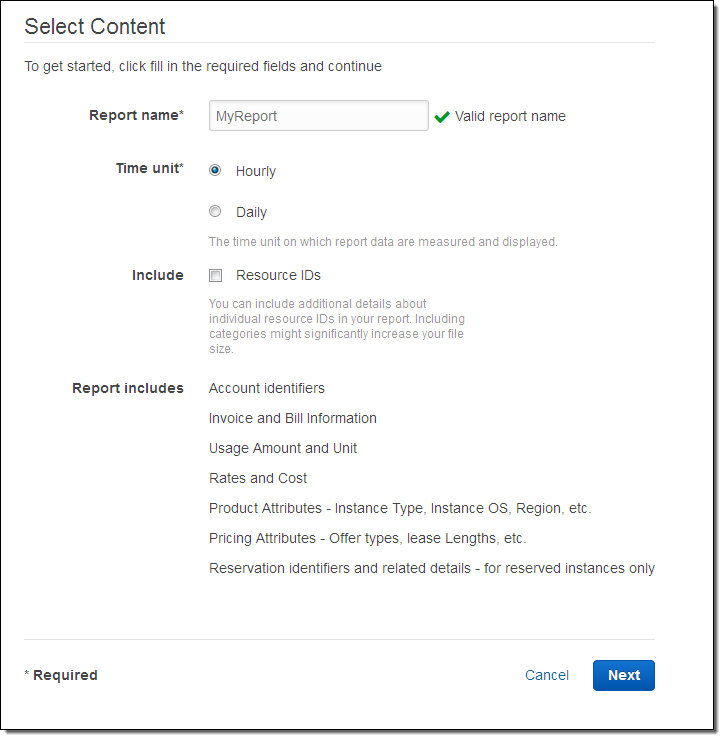 Many AWS customers have been asking us for a way to programmatically analyze their Cost and Usage Reports (read New – AWS Cost and Usage Reports for Comprehensive and Customizable Reporting for more info). These customers are often using AWS to run multiple lines of business, making use of a wide variety of services, often spread out across multiple regions. 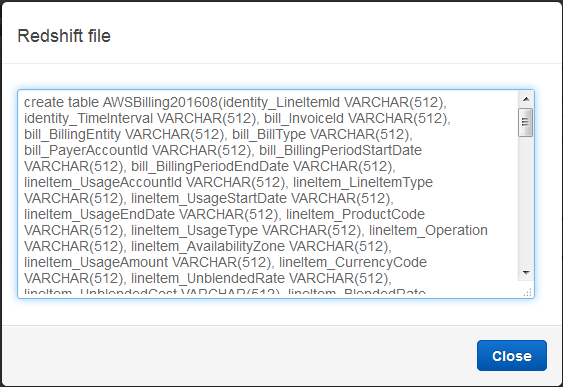 Because we provide very detailed billing and cost information, this is a Big Data problem and one that can be easily addressed using AWS services! 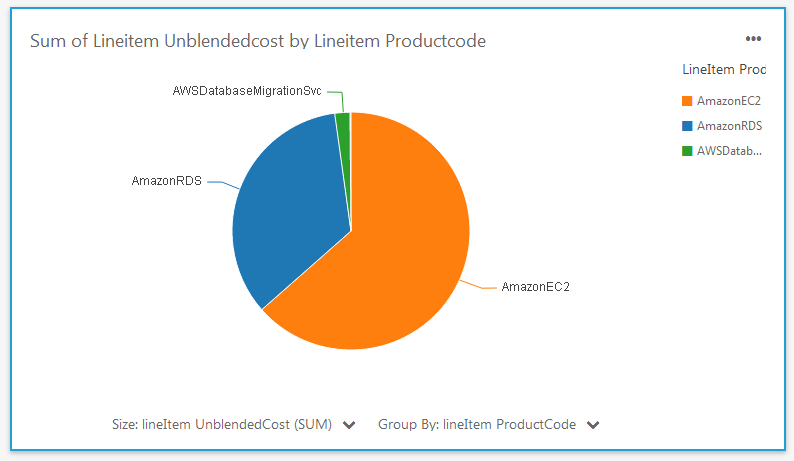 While I was on vacation earlier this month, we launched a new feature that allows you to upload your Cost and Usage reports to Amazon Redshift and Amazon QuickSight. Now that I am caught up, I’d like to tell you about this feature. Then I ran the SQL command. 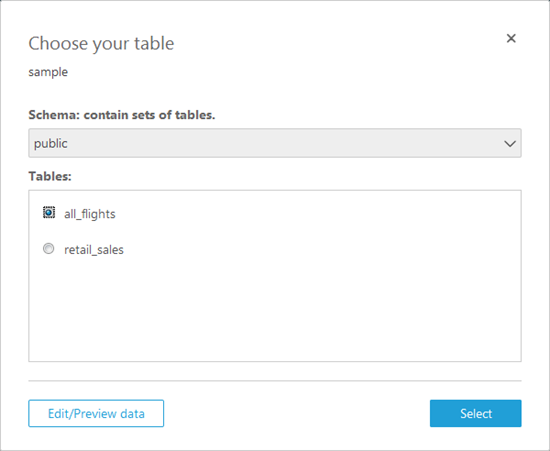 It created a pair of tables and imported the billing data from S3. 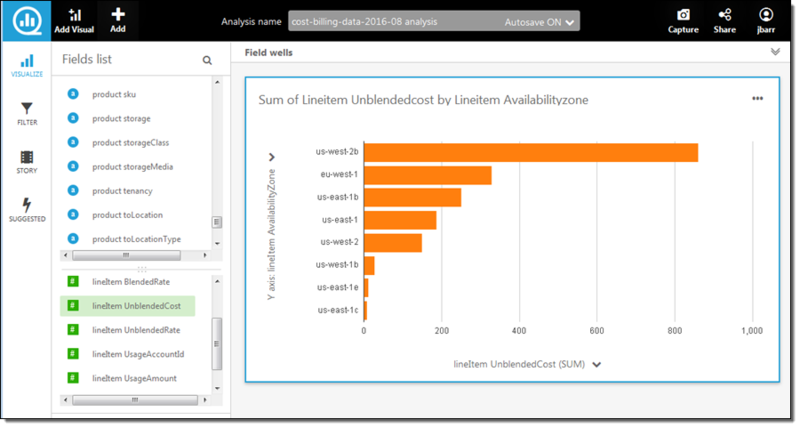 As you can see, the new data and the analytical capabilities of QuickSight allow me (and you) to dive deep into your AWS costs in minutes. Many of our customers have been asking us for data and tools to allow them to better understand and manage their AWS costs. Today we are introducing a set of new AWS Cost and Usage Reports that provide you with comprehensive data about products, pricing, and usage. The reports allow you to understand individual costs and to analyze them in greater detail. 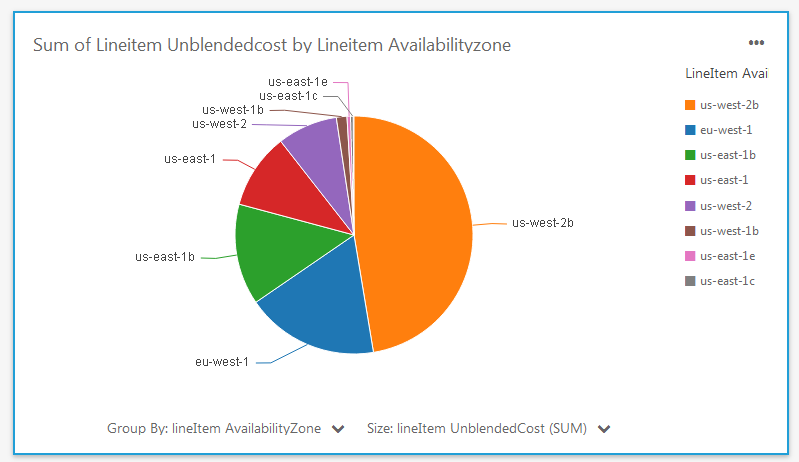 For example, you can view your EC2 costs by instance type and then drill-down in order to understand usage by operating system, instance type, and purchase option (On-Demand, Reserved, or Spot). 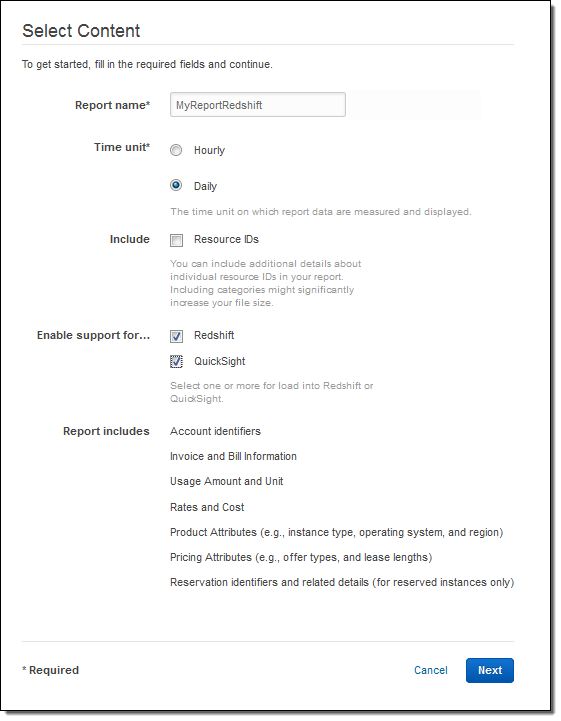 The new reports are generated in CSV form and can be customized. 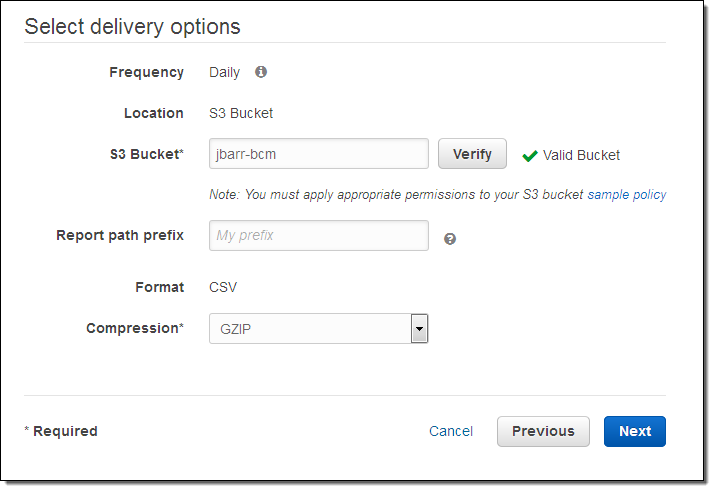 You can select the data included in each report, decide whether you want it aggregated across an hour or a day, and then request delivery to one of your S3 buckets, with your choice of ZIP or GZIP compression. The data format is normalized so that each discrete cost component is presented in an exclusive column. 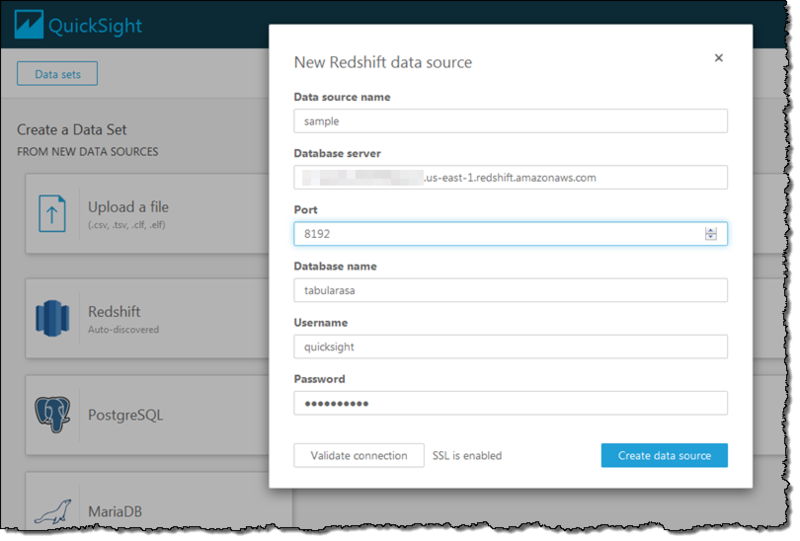 You can easily upload the reports to Amazon Redshift and then run queries against the data using business intelligence and data visualization tools including Amazon QuickSight. A fresh report will be delivered to the bucket within 24 hours. Additional reports will be provided every 24 hours (or less) thereafter. 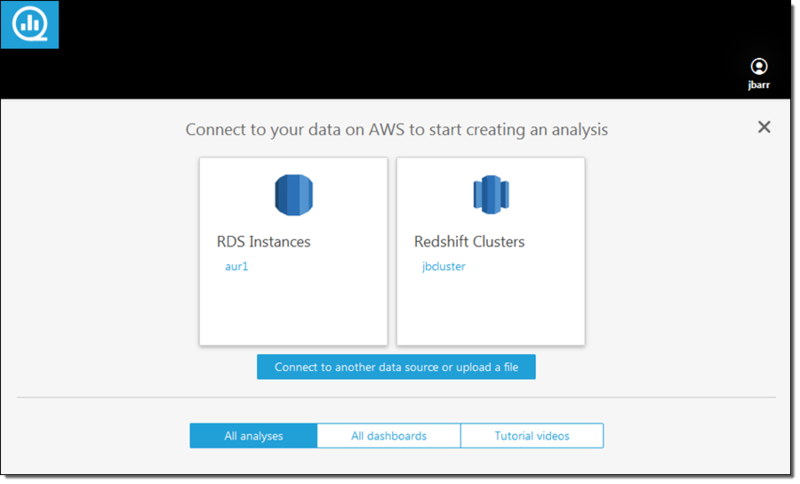 From there you can transfer them to Amazon Redshift using a AWS Data Pipeline job or some code triggered by a AWS Lambda function, and then analyze them using the BI or data visualization tool of your choice. To learn more, read about Understanding Your Usage with Billing Reports.